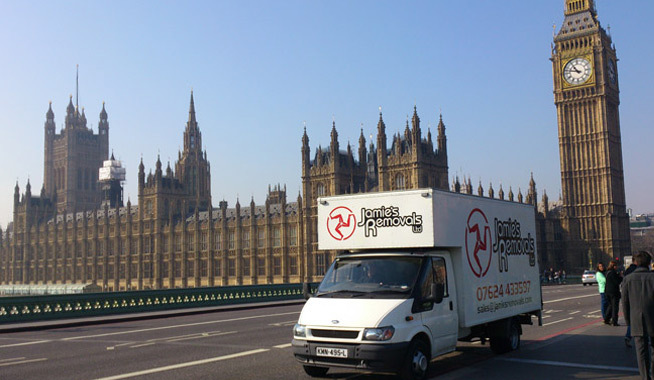 Whether you're moving within the Isle of Man, to the UK or abroad, Jamie's Removals can provide the complete service. Our staff will look after everything you need moved. Delicate items will be securely packed and furniture dismantled and reassembled as necessary. At the destination address, we will place all furniture and boxes in their required positions to ensure your move is as trouble free and relaxed as possible. We can offer transport to or from anywhere in the UK, and operate a regular UK service, accommodating full house moves, part loads and single items. We can also offer transport to many European countries using our own vehicles, or via our shipping agents in the UK. We know moving can be a strain on your nerves and your wallet, so we aim to be as flexible as possible, and keep our pricing extremely competitive. We offer a fast, reliable & professional service. Our vehicles come with plenty of blankets and ties to protect your furniture. Our phone is answered 7 days a week. Our charges are the same on weekends or evenings. We can dismantle and reconstruct beds and flat pack furniture. We are fully insured with goods in transit, public liability and storage insurance. For many removals, we can arrange a fixed price or hourly rate over the phone or by email, or alternatively, we can arrange a site visit to assess your requirements. To arrange for a quote, please call us on (07624) 433597 or (01624) 870110, or email sales@jamiesremovals.com. Our Mission Statement: To treat your possessions with the utmost care from collection to delivery, to respond quickly and efficiently, to facilitate your individual removal requirements, to be cost effective, to be hassle free and to exceed your expectations! When it comes to moving house you'll want to ensure all your treasured belongings are packed securely. We provide a professional packing service allowing you to concentrate on other parts of your move. Full Packing: Our removal workers will pack everything – books, toys, mirrors, gardening equipment, the lot. Part Packing: This is for those who are purely concerned about the fragile items. Antiques, china, glass, mirrors – we’ll take care of the most vulnerable things so you don’t have to worry. Self Packing: This is for those who prefer to pack themselves but need the materials to do it properly. We can supply the full kit – cardboard boxes, plastic removals crates, paper, bubble wrap and sealing tape. Cannot speak too highly of Jamie's Removals. We would like to recommend Jamie's who moved us today after we had been let down by another removal company, who cancelled with short notice. They were prompt, polite, careful and quick and very reasonable - from a very satisfied customer.